Linyanti in northern Botswana is said to be one of the last great wilderness areas in Southern Africa. Overlooked for decades, this beautiful region features exceptional game viewing and just a few private luxury camps to share the bounty. You can access northern Botswana on certain routes with a sedan vehicle, but with a 4x4 vehicle you can enjoy more adventurous routes such as Okavango / Savuti / Chobe on self-drive itineraries. Many lodges in the Okavango and Linyanti region have their own airstrip or share an airstrip with other lodges. Fly-in itineraries can combine certain lodges and routes in northern Botswana so you can experience a variety of different aspects to this multi-faceted region. Maun Airport is the main gateway for flights to the Okavango and Linyanti. From Maun you can connect on light aircraft charter flights to a number of airstrips in Linyanti and northern Botswana. Kasane Airport is also a hub for certain lodge routes and provides connections for access to Chobe, the Caprivi Strip and Victoria Falls. The Rivers running through northern Botswana just above the Okavango Delta are the lifeblood of this fascinating wildlife area. The Kwando River forms the border between Botswana and Namibia (the Caprivi Strip). The Kwando Concession is situated along the Kwando River and due to its variety of habitats attracts a lot of game especially Elephant, Buffalo, Lion and Wild Dog amongst a strong supporting cast.The Kwando River becomes the Linyanti River and then changes again to become the Chobe River. At the Linyanti juncture, the Linyanti Marshes are formed creating a permanent wetland area with small islands surrounded by grassy plains. This swamp is not unlike the Okavango with its lagoons, reedy channels and crystal clear waters. Linyanti is a magnet for wildlife and renowned for its high concentrations of game especially predators. This wilderness area is characterised by dense Mopane woodlands, pristine wetlands and open savannah. The Selinda Spillway links the Okavango Delta to the Linyanti Swamps and it is here you will find the Selinda Reserve, a small and private wilderness area with abundant wildlife including the big cats, Elephant and Wild Dog to name a few. The Savute Channel is fed by the Linyanti River. The Savute is a mysterious river as it is not affected by this regions rainfall - instead it will flow for some years and then dry up, only to flow again at a later time. When it flows the landscape is lush and green and wildlife such as Elephant, Lion and Zebra thrive, and when it is dry, the waterholes are the only source of water for miles around, attracting thirsty wildlife. The Linyanti and its associated regions offer spectacular wildlife viewing on safari. This area is one of Botswana's best kept secrets. Linyanti has been overlooked for years and is only now coming into its own as animal migration paths are restored. The Linyanti and Savuti Zebra migration is an example of a little known event that happens every year. Beautiful riverine forests (favoured by Elephant) combine with wetlands and open grasslands for a variety of wildlife habitats. The private reserves in this area offer off-road game viewing, night drives and bush walks which are not usually offered in state national parks and reserves. Photographic safaris, river cruises and boating, fishing, game drives (day and night), bush walks and cultural village visits. The Dry Winter Season (May to October) - as water sources dry up wildlife gathers along the river and at waterholes creating a throng which is brilliant for game viewing activities. This season gets progressively warmer to the hottest month which is October. The Wet Summer Season (November to March) - this is the rainy season and vegetation is lush and green and many migrant birds arrive. Temperatures and humidity are high. On safari, your impression of this region is that it is an unspoiled and pristine wildlife area. You will be off the beaten track in a region that was until recently set aside for hunting only. With the hunters long gone, the wildlife has returned in great numbers. This region's new status and appearance on the safari map has caused quite a stir. You can expect to see huge herds of Elephant passing through Linyanti in the dry season, lingering in the Mopane forests and at the riverside where there is permanent water. Masses of Zebra and other antelope species spend the winter in Linyanti and then migrate to the Savuti in the summer months. With this incredible bounty of tasty plains game, predators take full advantage, so sightings of Lion, Cheetah, Wild Dog, Hyena and even Leopard are excellent. Bat-eared Foxes are also commonly seen while the waterways are the domain of Hippo and Crocodile. Rarities in Linyanti include the magnificent Sable and Sitatunga antelope as well as the Narina Trogon bird species. Birdlife here is fantastic with a variation of habitats to keep it really interesting. You'll know you are in the Linyanti region because of the loud chorus of birdsong at dawn. In the riverine woodlands you'll see Jackalberry trees and also Sausage trees with their stunning red flowers and long dangling pods. Because the Linyanti region is less well known, a handful of luxury lodges have the run of the place which means 'exclusive and private' appears a lot in their descriptions. Duma Tau Camp combines the Linyanti and Savuti on the border of Chobe National Park, while Kings Pool Camp overlooks a lagoon in the private Linyanti Reserve. 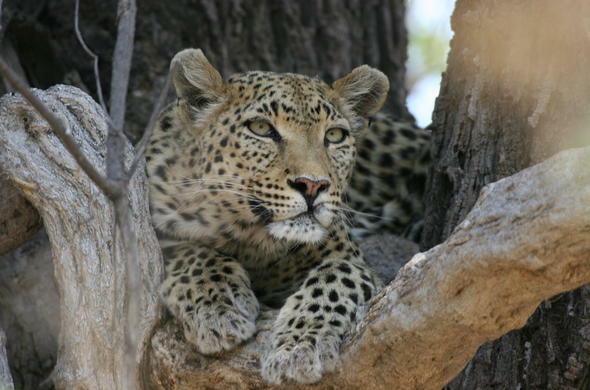 Savuti Camp offers wonderful game viewing around a precious water source in the Savuti area. Lebala Camp offers intimate accommodation in the Kwando Concession. Savute Elephant Camp and Savute Safari Lodge provide great safari settings within the Chobe National Park (but no night drives or walks). Prepare for the heat in this part of the world. During peak winter months only, it will still be sunny in the day with a drop in temperature at night, otherwise the climate is very warm to hot. This is a malarial area so precautions are necessary. The hot, wet and humid conditions of the summer season are great for breeding mosquitoes, so apart from oral anti-malarials you will need to protect exposed skin, in particular around wrists and ankles, and cover up especially at sunset.